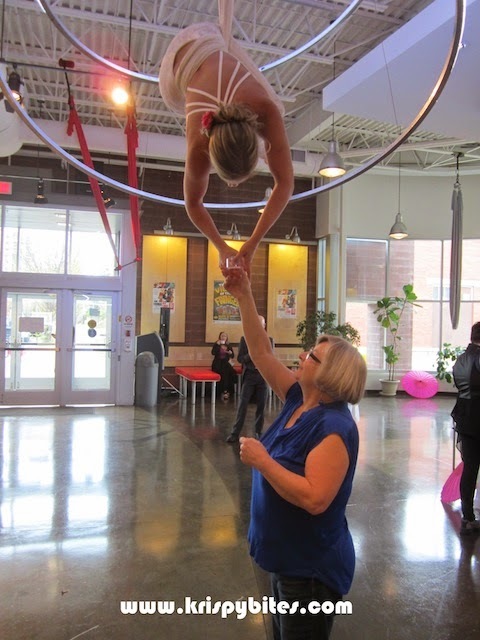 Last year in October, I attended "High Tea: An Elevated Fundraiser", presented by Firefly Theatre and Circus to raise funds for their new aerial musical performance called Craniatrium. 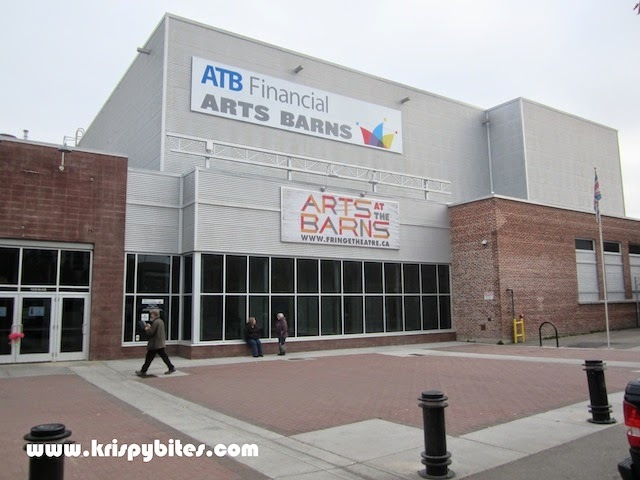 The event took place at the ATB Financial Arts Barns in Old Strathcona. The price tag was high at $50/person, but it was reasonable if I thought of it as an afternoon of entertainment and snacks rather than just a regular meal. And the experience was definitely more exciting than the average high tea. Upon entering the venue, we found several tables set up along one side of the room. 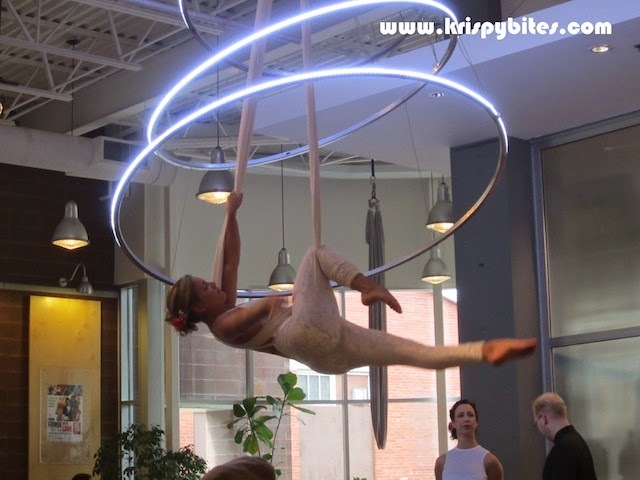 We grabbed a seat and watched as one of the performers did her acrobatics on the suspended aerial silks. She also managed to pour and serve drinks upside down! 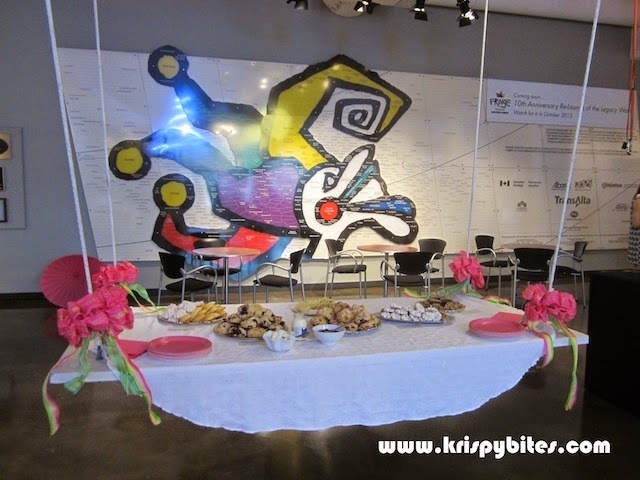 Most of the food was laid out on a suspended table. 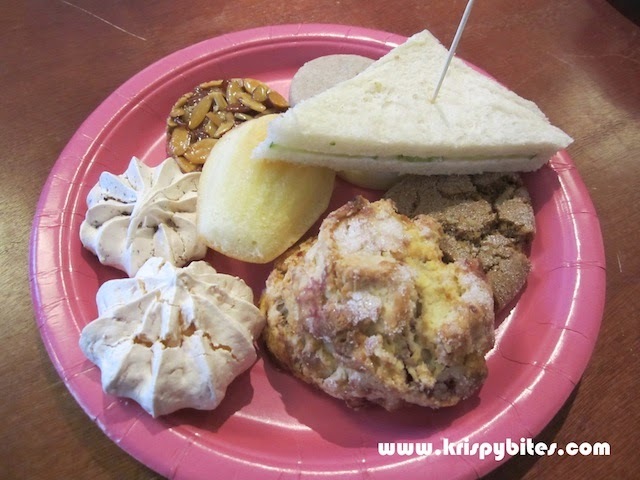 The baked goods were supplied by Duchess Bake Shop, one of my favourite dessert stores in Edmonton. I ended up stuffing myself with too many sweets! 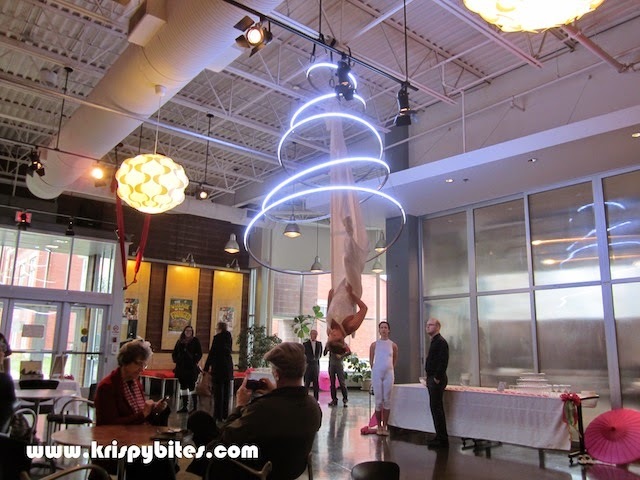 Some of the food was served on a tray held by a suspended performer. Several performers took turns doing this throughout the event. One of them was even able to do flips while holding and keeping the tray upright! 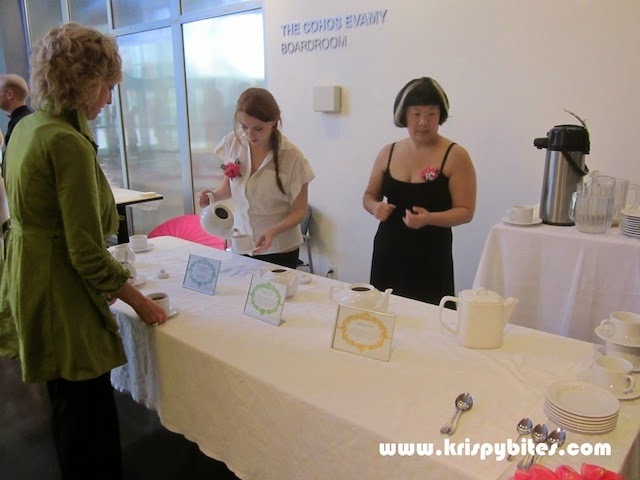 The tea station offered a choice of three teas from Acquired Taste Tea Company, an Edmonton-based shop that specializes in tea and tea products. And if that wasn't enough tea for us, we were treated to individual tea leaf reading sessions with the Spirit Sisters of the Flying Seance. As the event came to a close, we got a sneak peek of Craniatrium in the form of a song. The singer's voice was so charming and magnetic that everyone seemed to hold their breath as he sang this beautiful melody. 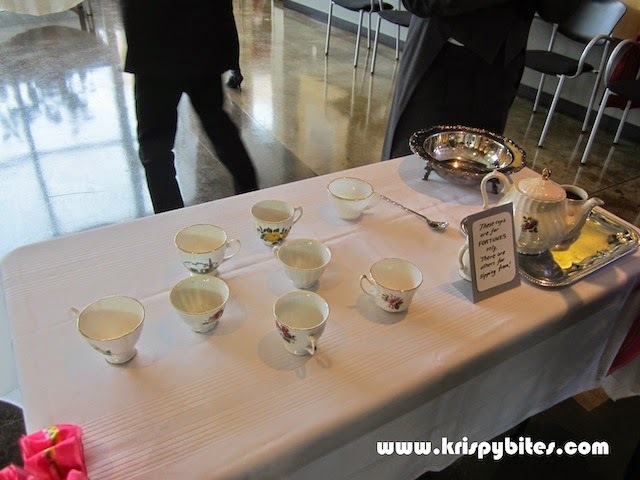 For anyone who hasn't been to a similar event, this elevated high tea is definitely worth checking out. 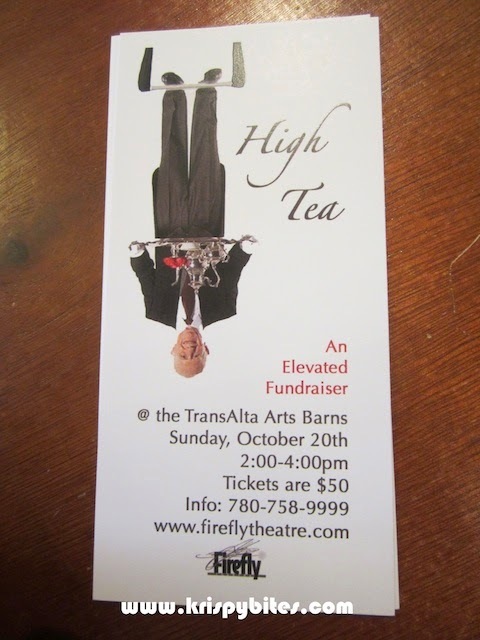 Unfortunately, it doesn't look like Firefly Theatre is hosting a high tea this year. Hopefully there will be another one soon!